Ross Technical Director Ken Langhorn announces the addition of a new 10-gallon PowerMix Planetary Disperser to the Ross Test & Development Center. The vacuum-rated mixer is equipped with a dual-bladed high speed disperser and a helical high viscosity planetary stirrer. A patented mixer design (US Patent No. 4,697,929), the PowerMix is used for dispersing powders, fibers or other solids into liquid and as the material thickens, the combined mixing power of its agitators can continue to apply high levels of shear even after the product has reached a viscous, non-flowing state. The Ross PowerMix Model PDM-10 features a portable mix vessel, air/oil hydraulic lift to raise and lower the agitators, multiple sight/charge ports, tank light and NEMA 12 control panel. 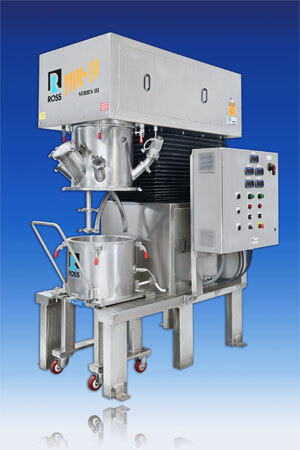 This unit is one of over 40 mixers and blenders being offered for no-charge demonstration and testing utilizing customers’ actual raw materials. For more than 50 years, the Test & Development Center has played an important role in helping Ross customers identify the best possible equipment for their particular application, generate data for scale-up, or solve a mixing problem. The facility also houses a well-equipped analytical laboratory for quick evaluation of samples produced in a mixing trial. Any hazardous materials that cannot be safely handled in the Test & Development Center can be batched in the customer’s own plant through the use of rental equipment.